It's the season for pumpkin and I bought two cans of pumpkin puree for all my baking needs this fall! I opened up my first can last week to make pumpkin bars. I've made them once before a few years ago and I remember them being really good. Well, my memory wasn't wrong in remembering how tasty they were but I forgot that they turn out more cake-y and not very chewy. 1. Preheat oven to 350 degrees Fahrenheit. Butter and flour a 9x13 baking pan. 2. Combine the flour, baking powder, baking soda, cinnamon, and nutmeg in a bowl. 3. In a separate bowl, beat the eggs and sugar with an electric mixer until fully combined. 4. Add in oil and pumpkin and beat until well blended. 5. Mix in the dry ingredients. Pour batter into the pan. 6. Bake for 25-30 minutes or until cake is springy to the touch. Cool completely. 7. Now to make the cream cheese frosting, add cream cheese, icing sugar and lemon juice to a bowl and mix with an electric mixer. Mix until you have a smooth, spreadable frosting in your bowl. 8. Spread frosting over bars. Eat and enjoy! As usual I added some coloured sugar to the frosting because sprinkles make everything better! 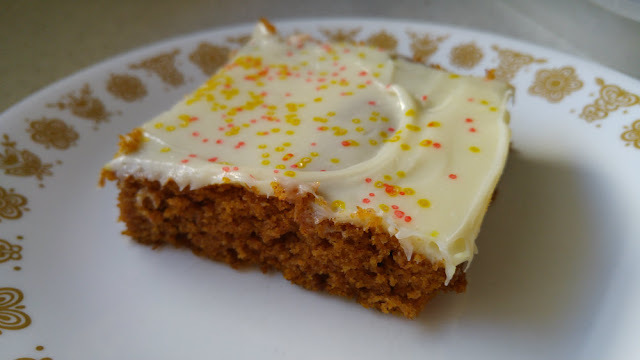 The cream cheese frosting makes these bars amazing in my opinion. 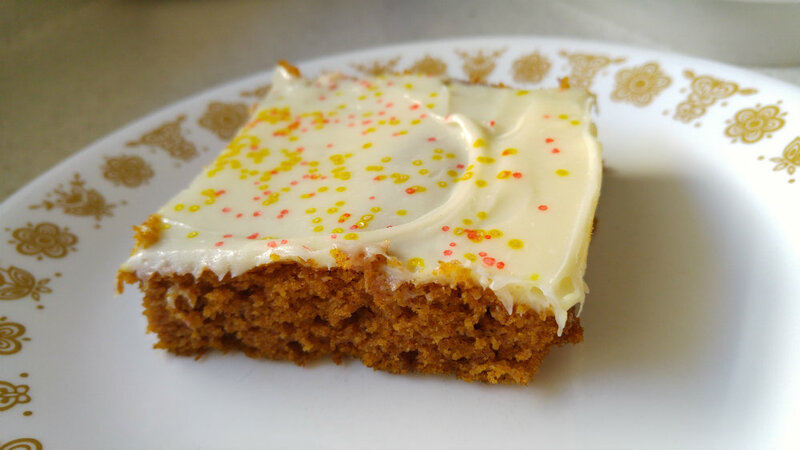 The lemon juice adds a nice touch to the flavour and the frosting is so creamy. I have a couple more pumpkin recipes I'll be trying over the next month and I'll be sure to share any great ones I come across!